I love holidays, I always have. Ask any of my family and they will tell you that I am one of the first people trying to drag out decorations and get others in the spirit. That is why I get so excited when Fall is finally here. This is when Halloween begins and the holidays just keep on coming after that. The one constant in every holiday is the food. Food is what helps to make these holidays great and there are so many fun things you can do with it. 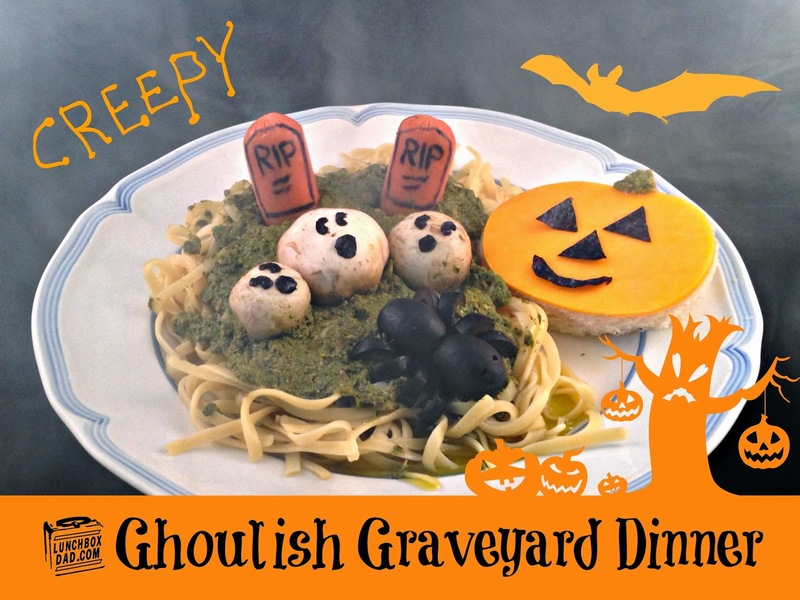 Halloween meals are some of the best and so in preparation for the upcoming "spooktacular" month ahead, I wanted to share this pasta recipe. It is an easy dinner for kids and great for the whole family! I prepared enough food for a whole family. If you have more or less people please adjust the recipe accordingly. Remember, having leftovers is never a bad thing! Leftover pasta and sauce are great in lunchboxes the next day. 1. Bring water to boil in large pot and cook pasta according to directions. They were very easy to follow on the package. Empty basil pesto sauce into small saucepan and heat on low until desired temperature is reached. Be sure and stir pasta and sauce regularly. When pasta is done, drain in colander and set aside. 2. Heat up hot dogs either on the stovetop or in the microwave. When they are done cooking, cut hot dogs in half. You will use each half as a tombstone later on. 3. Boil mushroom caps in pot of water for 5 minutes. Boiling them in water will help to retain the white color which is essential in making the ghosts. 4. Arrange desired amount of pasta on each plate. How much you put on is completely up to you, but you want to make sure and leave room for all the elements of the dish. Top the pasta with the pesto sauce. Use just enough sauce to cover most of the pasta and to create the green grass effect as shown in the picture. DO NOT MIX SAUCE INTO PASTA. 5. Stick two olives together, end to end, using a toothpick. These will be the body of the spider. You will need to do this for each plate of food. 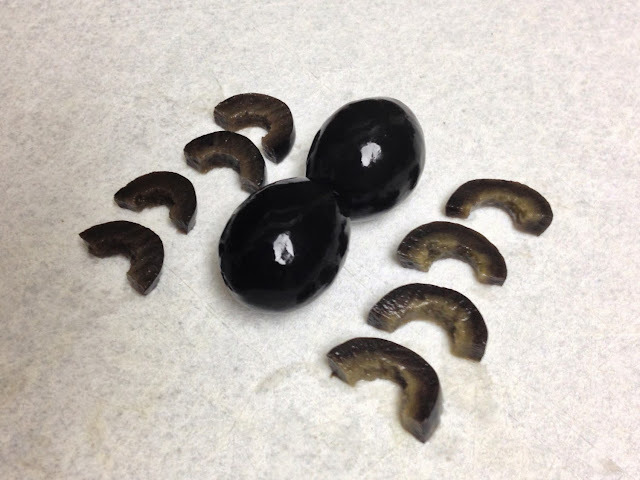 Cut remaining olives into slices and then cut those slices in half. These will form the legs of the spider. Place spider body where desired on top of the pasta. Arrange spider legs on the sides of the body. You will place four legs on each side. 5. When hot dogs have cooled down a bit, wipe off the moisture with a paper towel. Write the word, "RIP" on the top of each using black food coloring. I use two drops each of blue, red, and yellow to create the black color. Use a toothpick to write on the hot dog with the food coloring. Alternately you could use a black food coloring marker. If desired, trace the edge of the tombstone on the hot dog. Stick the hot dog half into the pasta. Make sure and push it down enough for it to stay standing. Surround it with pesto sauce to stabilize if needed. 6. Cut facial features out of the sheet of nori with scissors. Use simple shapes because they are easy to cut out. Three circles for each mushroom ghost will work for their eyes and mouth. Remember to also cut out the eyes, nose, and mouth for each cheese pumpkin. Arrange mushrooms on top of pasta and place two eyes and a mouth on each to make the ghost face. 7. Cut pumpkin shape out of each slice of bread and cheese. You can use a knife to cut the basic shape, or to make it easier, use any pumpkin shaped cookie cutter. Cookie cutters work on bread, cheese, and other soft foods! Put the slice of cheese on top of the bread. Place the nori eyes, nose, and mouth on the cheese for the face and dab a little bit of pesto sauce on the pumpkin stem to make it green. 8. 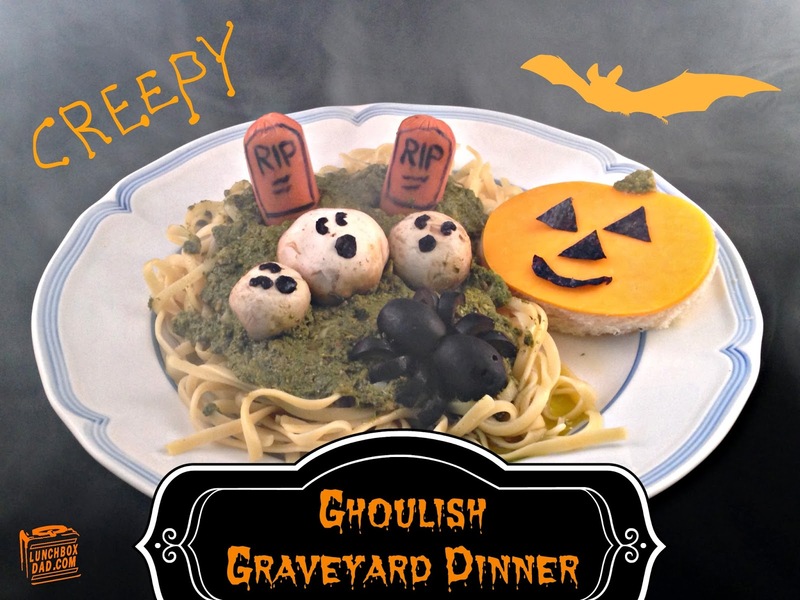 Finish by putting each bread and cheese "pumpkin" next to your pasta on the plate and you have a fun Ghoulish Graveyard Pasta Dinner! Awesome creepy pasta dinner! Love the spider! Thanks, I wasn't sure how the spider would turn out but I like it too! OMG...Smart & Final. I remember that place. We bought a lot of things there for our wedding reception! I shop at Smart & Final a lot, especially for parties and events. That store really comes in handy and it is super close to my work. Thanks! If they were carrots my kids probably wouldnt have eaten them! I was just hoping they would try the pesto and they loved it. So awesome! I love the mushroom ghosts! So creative! What a fun Halloween dinner!! Thanks, the family definitely liked it! This is so cute and inventive. I love this! I seriously can't get over how fun this dish is! I'll definitely be adding it to my Halloween Recipes for the kids! Thanks Sara, you should definitely try it!